The Bangladesh Environment Conservation Act 1995 clearly states the owner and importer of ships, as well as users of shipbreaking yards, must ensure that scrapping does not cause any pollution or health hazards through releasing hazardous wastes. Recently, the Department of Environment (DoE) conducted several drives at some of the shipbreaking yards in Sitakunda upazila, Chittagong. During the drives, the DoE team discovered that only two of the eight shipbreaking and recycling yards have functional waste management systems. Breaking with Tk60,000, HM Ship Breaking with Tk80,000 and SL Ship Recycling was fined with Tk50,000. They were fined for not maintaining waste management operatives. Additionally, Golden Steel Alloy Works Ltd was fined with Tk5 lakh for illegally building ships inside the yard and having a non-functional waste management system. On January 4, a DoE team visited Parky beach under Anwara upazila, Chittagong, and discovered that an MV ship, Crystal Gold, was being scrapped illegally. Later the errant ship breaker Four Star Enterprise was fined with Tk2 crore for destroying marine ecology and biodiversity of 1,491 decimal land on the beach. Muktadir Hasan, assistant director of DoE (Chittagong region), told the Dhaka Tribune that they conducted drives in recent times and found that some shipbreaking and recycling yards have no functional waste management system, which is a clear violation of the clearance certificate. "A shipbreaking or recycling yard must keep some equipment functional like the oil-water separator, incinerator and facilities for temporary storage of hazardous and non-hazardous waste materials," he said. "We will conduct drives against the errant shipbreakers on a regular basis." Out of 150 shipbreaking and recycling yards in Chittagong, only 81 yards have obtained licenses from the DoE. Prof Maruf Hossain and Mohammad Mahmudul Islam jointly conducted a study on the shipbreaking activities and its environmental impacts. In 2006, Young Power in Social Action (YPSA), an NGO working for defending workers’ rights and protecting the environment, published a book based on the study titled "Ship Breaking Activities and Its Impact on the Coastal Zone of Chittagong, Bangladesh: Towards Sustainable Management." According to the study, ships brought in for scrapping are not properly cleaned before beaching. Generally, an eyewash test is carried out to certify that a ship is free from dangerous chemicals and fumes. The materials required to build ships contain a number of hazardous substances. Scrapped ships have an unleaded weight of between 5,000 and 40,000 tons, 95% of which is steel, coated with between 10 and 100 tons of paint containing lead, cadmium, organotins, arsenic, zinc and chromium. Ships also contain a wide range of other hazardous wastes: sealants containing PCBs, up to 7.5 tons of various types of asbestos and several thousand litres of oil (engine oil, grease, bilge oil, and hydraulic and lubricant oils). Tankers additionally hold up to 1,000 cubic meters of residual oil. Most of these materials have been defined as hazardous waste under the Basel Convention, the study pointed out. According to a publication of the International Labour Organization, in addition to taking a huge toll on the health of workers, shipbreaking is a highly polluting industry. Large amounts of carcinogens and toxic substances not only intoxicate workers but are also dumped into the soil and coastal waters. An average sized ship contains up to 7 tonnes of asbestos, which is often sold in the local communities after scrapping. As the majority of yards have no waste management systems or facilities to prevent pollution, shipbreaking takes an enormous toll on the surrounding environment, local communities, fishery, agriculture, flora and fauna. This naturally causes serious environmental damage with long-term effects for occupational, public and environmental health. Speaking to the Dhaka Tribune, Md Abu Taher, president of Bangladesh Ship Breakers and Recyclers Association, admitted some errant yards had been penalized by the DoE for not maintaining a functional waste management system. "As you know, it requires a huge sum of money to have a full-fledged waste management system in a shipbreaking yard. However, we are trying to bring the shipbreaking and recycling activities under compliance," said Taher. According to Bangladesh Ship Breakers and Recyclers Association, there are 60-70 shipbreaking yards that are now in operation on the 25km strip of Sitakunda upazila in Chittagong. 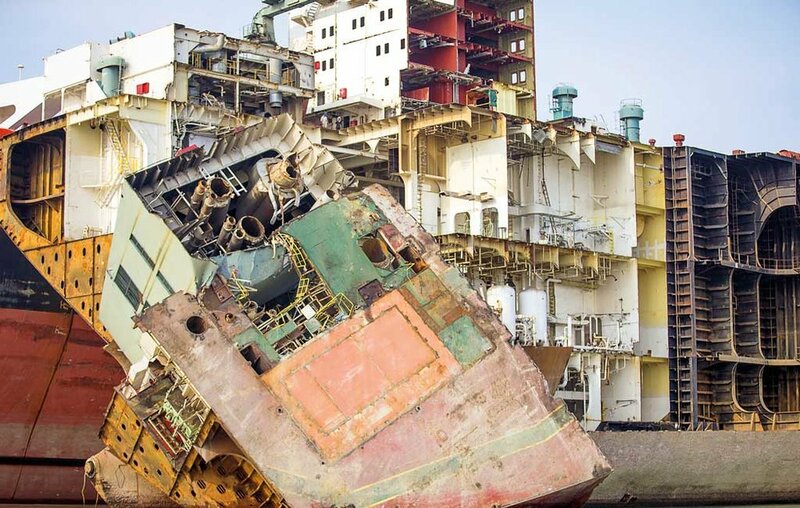 Muhammad Ali Shahin, senior programme coordinator of YPSA, said the fact that six out of eight shipbreaking yards have non-functional waste management is just the tip of the iceberg. "There is no point in having a waste management system if it does not function," he said. "Shipbreaking is an industry where different types of hazardous wastes are produced. Therefore, a dysfunctional waste management system means that waste is getting mixed with earth, air and water and causing environmental pollution,” he noted. "We request the errant shipbreakers to follow the example of complaint enterprises. We want it to emerge as an industry in the real sense of the term," said Shahin, who has been working with the shipbreaking sector for almost 18 years. According to environmentalist Dr Edris Ali, the DoE should intensify its drives against non-compliant shipbreaking yards. "There is a lack of monitoring by the DoE over the shipbreaking yards. The DoE should not renew the certificates of non-compliant shipbreaking yards," said the environmentalist. "A shipbreaking yard produces hazardous waste, which can be categorized into liquid, solid, gaseous and radioactive. Untreated liquid waste from a shipbreaking yard finds its way directly into the Karnaphuli river and Bay of Bengal, thereby endangering aquatic ecology. "The toxic substances released from the shipbreaking yards accumulate inside fish, ultimately posing serious health risks for us," he continued. "Instead of setting up Effluent Treatment Plants individually, the shipbreakers should go for a Central Effluent Plant," said Dr Ali, also a professor of chemistry at Government Hazi Muhammad Mohsin College.